If you have downloaded my Insurance Android App – Insurance Returns, a very big thank you and I hope that the App has provided you some form of benefits in understanding the insurance rate of returns of any regular savings plan and single premium savings plan! But if this is the first time you are reading this… do let me share what the App can do for you especially if you have intentions to promote (as a Financial Planner) or buy a Regular Savings Plan like an Endowment Plan or those Single Premium Plans like a Fixed Deposit Plans. In Summary, rather than appreciating the final value on maturity, e.g. you save $10,000 in total premiums for 10 years and you are expecting to receive $12,000 in projected maturity at the end of the term, which you have made an extra $2,000 from your $10,000… you get it in the form of compounding rate of return in 3.28% per annum. This would mean that this plan is sound and worth venturing into if most of your savings are merely generating around the range of 1% per annum. But if you are one that is concerned about inflation which is an average of 5% per annum, this plan may not be that attractive because the plan is not working hard enough for you to combat against inflation! And with the Insurance Returns App, it will save you a lot of hassle of doing the calculation! For example, all you need are to key in the annual premium, the projected maturity, the policy term and you get the compounded return! That’s it! I have since updated the App to Version 1.3 whereby you enjoy a reduced file size from the initial 4 MB to around 2.1 MB as well as a new calculator that will allow you to calculate returns from those Limited Premium Term Plan like those Children Education Plans whereby it’s normal to have policyholders to pay for a limited premium term, e.g. 5 years, to stop paying after that and let the plan continue to the end of the Policy Term, e.g. 15 years (10 years of non-paying). The Calculation involved is not like the regular calculation you would use for Regular Savings Plan and the formula involved does involved a combination of both regular and single plans. And I can safely say that even if you are well-versed with a Financial Calculator, you will not be able to calculate the value out unless you use the SOLVER formula you get from Microsoft Excel. Since you do not have to fire up an Excel Program to calculate this… all you need are to download this App and you will be able to calculate the Returns out! 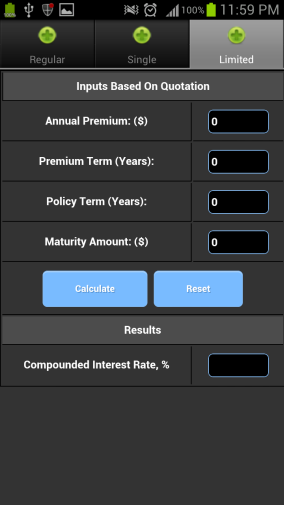 If you are interested in appreciating the rate of returns from Limited Premium Term Plans and you have an Android SmartPhone or Tablet, do head over to the Google Play Store and download it! It’s Free! Feedbacks and Suggestions are welcomed!